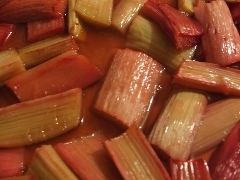 Place pan in oven and bake 20-30 minutes until the rhubarb is just tender. It's important not to overcook the rhubarb. NB When cooked this way the fruit retains its shape and rich colour and is truly delicious. Note that no extra liquid is added.